Can humanity achieve peace by making war? In the eight issues collected in Jack Kirby's O.M.A.C. : One Man Army Corps, Kirby examines a world where soldiers are obsolete, and governments use intelligent machines to fight secret battles against their enemies. Kirby's story seems a classic superhero tale of good versus evil, but on closer inspection we find the good perhaps isn't so good. The O.M.A.C. series subsists on one resounding contradiction: the futuristic Global Peace Agency, with such strict laws of nonviolence that each member vows never to hurt another human being, creates a super-weapon in the form of a man to fight their battles. Believing, they say, that waging war with a large army would cause them to face large armies in return, they instead employ the O.M.A.C. to fight their battles while looking on from their home base. The members of the GPA are faceless, purportedly so as to represent all nations without discrimination; at the same time their dispassionate approach to combat brings to mind a cold assassin, and one can't help but view the hoods they wear as akin to those of executioners. O.M.A.C. himself looks like the war god Ares, but hides within the sniveling, milquetoast (and aptly-named) Buddy Blank. Kirby never quite makes clear why the GPA chooses Blank to become O.M.A.C., but they again show their eerie dispassion in plucking him from his life to "atomically" reorganize him into their weapon. In a strange parallel, Blank becomes O.M.A.C. to rescue his attractive co-worker, only to learn that she herself is a faux human created as a bomb; Blank indeed becomes much the same. There's an odd scene a few issues in where the GPA introduces the O.M.A.C. to its new volunteer parents, whose purpose is never quite explained (Blank, we presume, had parents of his own). There's a sense that the GPA recognizes they've stolen Blank's identity from him, even if they're not moved enough to release him, and so tries to offer a substitute for love without understanding the inherit impossibility of doing so. Indeed there's much that was once genuine in "the world to come" -- as Kirby's calls the future in which O.M.A.C. takes place -- that's now been commodified. Blank's original employer Pseudo-People sold faux people for companionship, and later for assassination. The villain Mr. Big, in another story, rents an entire city for a private party, forcing the city residents to remain off the streets all night -- and then he, too, turns the city into a trap for O.M.A.C. Kibry's future is a world that money can buy anything, and anything that can be bought can be repurposed to kill -- often in the pursuit of more money. Concepts like emotions have become commodities, and even as the story's hero fights his equivalent villains, it seems that neither the Peace Agency nor the villains are immune to the corruptive nature of this society, with O.M.A.C. caught in the middle. Jack Kirby never finished his O.M.A.C. saga, ending the series rather abruptly, and his former assistant Mark Evanier in his introduction puzzles over, but never offers answers to, the story's meaning. Surely there's something just a little sinister intended in the Global Peace Agency, and an allegory hidden in the GPA having transformed Buddy Blank into the ultimate weapon and then inexplicably promoting him to an extent that no GPA member can give him orders, effectively ceding control of said weapon. Also telling is the final story in which an increasingly sympathetic villain fights the GPA's Brother Eye satellite in a battle of man versus machine that leaves the reader unsure whom to root for. Kirby's O.M.A.C. is deceptive -- seemingly the story of a covert intelligence group that fights for peace, it's instead a treatise on the futility of that fight. Kirby presents O.M.A.C. as simultaneously a warrior and a victim, and in doing so reveals the shortfalls of the cause to which O.M.A.C. is drafted. Constant readers know I'm not much for pre-Crisis storytelling, and indeed there's not much of a constant, driving plot in this O.M.A.C. collection, but the sheer volume of what Jack Kirby's trying to say here makes it worth the read (if not for the sheer number of Countdown to Final Crisis in-jokes I understand better now). Certainly this volume deserves a place on your bookshelf next to your other Jack Kirby omnibuses. We rejoin the fight now with Countdown to Final Crisis Volume 3, coming up next. That sounds like a great idea! It would look amazing next to the FOURTH WORLD and DEMON omnibus collections. Thanks for reviewing this one, CE - I keep meaning to pick it up but then dither about whether I'll enjoy the story - it gives the impression of being 'of its time' somewhat. I think I'll take the plunge anyway. Others finished the OMAC story? How faithfully did it hew to Kirby's beginning? That's very interesting! Jim Starlin's OMAC was my introduction to the character. At the time, I loved everything he did. Only in retrospect (after having read Kirby's 8 issues) did I realize just how wrong-headed and series-destructive what Starlin did was. By comparison, Mishkin, Cohn, LaRocque & Colletta, whose episodes seemed lame & 3rd-rate, actually tried hopelessly to steer it back toward Jack's original intent... they just didn't have the talent to pull it off. No, the guys who "finished" OMAC right-- and I mean REALLY right-- were 2 UK fans, David Morris & Dek Baker, who published OMAC #9 in 2002. It picks up EXACTLY where Kirby's final issue left off, totally ignores Starlin's blasphemy, and, astonishingly, CAPTURES both the look, but more importantly, the FEEL of Kirby's writing. 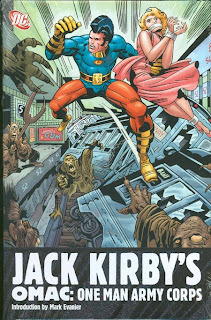 They did the impossible, and in an amateur fan way, did a Kirby book that feels like Jack wrote it himself. If DC had any sense at all, they would have struck a deal to include Morris & Baker's fanzine episode in their official collection. Without it, the last story is just INCOMPLETE.